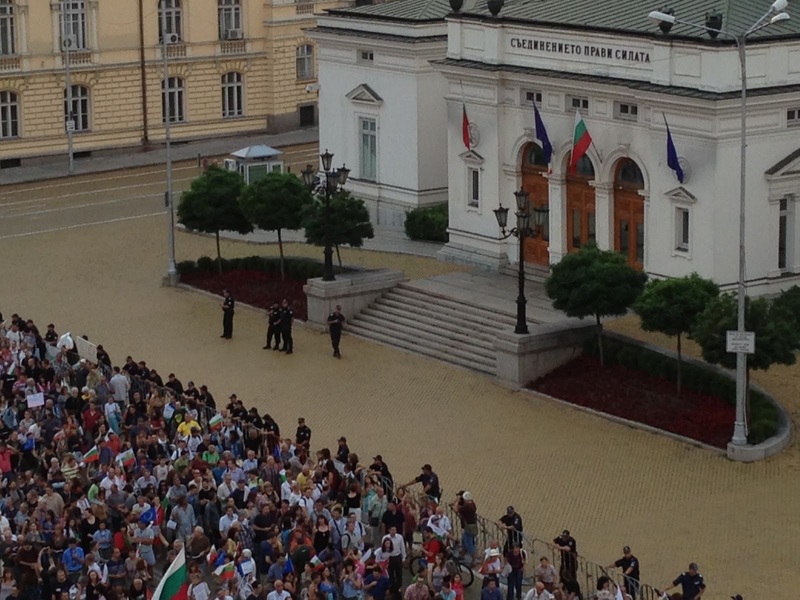 On July 24, Bulgaria made it into most of the international media flagships. European and US media alike mentioned the country on their websites, some of them even showing pictures of Sofia by night. Unfortunately, the occasion is a very sad one: In the night before, the police exercised severe violence on the protesters who had surrounded the building of the national parliament. Provoked by this alarming news, I wrote a piece in German yesterday which Open Europe Berlin published immediately. I am very grateful to OEB for this publication, but some of my social media friends, especially the ones who actively participate in the protests, urged me to write something similar in English, since German is only the second most widely spoken Western language in Sofia. So let me summarize some of yesterday’s impressions and enhance them with some further thoughts on the recent developments in my native country. In the beginning, I would like to embed my story in a historical retrospect, since today’s malfunctions of the political system are difficult to grasp if one is not familiar with the peculiarities of recent Bulgarian history. Bulgaria’s transition has been a very intricate process, much more problematic than the corresponding developments in Central European countries like Poland or the Czech Republic. All started in 1989 when, unlike the velvet revolution countries, the communist elite itself fabricated a turnover of the old regime, very subtly replacing it with new structures in which the old figures of the communist party and its subsidiary organizations managed to retain important “commanding heights” both in the political system and the economy. Since there were comparatively few foreign direct investments in the transition’s first years, the old elite and its newly founded commercial banks succeeded in privatizing large shares of the economy, a development quite similar to Yeltsin’s Russia, with the notable difference that Bulgaria lacks the huge natural resource reserves of the Soviet Union. Also, organized crime flourished at all levels, so a dangerous blend of economic interests and new political structures came into being, a trait of the country which until today is one of the most heavy burdens and obstacles for a development towards a free order. You can call it an oligarchy like in Russia, but to me “cleptocracy” seems a more appropriate term, since enriching oneself at the expense of the public has been the core behavioural pattern of the new elite. The old communist party changed its name to Bulgarian Socialist Party (BSP), also some of the leaders changed, but unlike most of the former communists in Central Europe, the party never really turned into a social democratic entity of the Western European type. Reminiscences of the “good old times” when Bulgaria was the most loyal Soviet satellite remained a persistent part of the party’s rhetoric. In the winter of 1996/97, BSP’s government brought the country to the verge of economic collapse, hyperinflation plaguing the country and dispossessing many Bulgarians of their entire savings. When mass protests formed in the beginning of 1997, the party’s leadership was at a loss, then tried police violence on January 10th, 1997, but eventually had to step down and only came to power again in 2005. In the term 2005-2009, the BSP-led coalition was successful in finalizing Bulgaria’s process of joining the EU, it also introduced some surprising economic policy measures like a 10% flat tax rate on both personal and corporate income, the lowest rates in the entire EU. These rather libertarian reforms were indeed surprising at first glance, but it soon became evident that they were introduced also in order to lower the tax burden for the country’s cleptocratic politico-economic elite. In this period, organized crime showed again its ugly face, both in shootings on the streets and in countless corruption scandals, so the government lost the 2009 elections to Boyko Borisov and his party GERB, which claimed to be a center-right alternative to the socialists and their partners. This government had a hard time dragging the country through the years of stagnation which began soon after the 2009 elections and tried to contain organized crime, or at least attempted to provoke this impression in the media. Borisov, somewhat clumsily, often reminded the EU partners of the exemplary fiscal discipline in Bulgaria, and it is indeed true that the governments since 1997 were highly successful in reducing the country’s public debt level, which dropped from around 90% of GDP in 1999 to around 14 % in 2009. In recent years, it has gone up under Borisov’s government to around 18% now, but is still very moderate as compared to the debt-plagued EU, not to mention the Southern neighbour Greece. Also, since 1997 the country has experienced spectacular monetary stability, since after the hyperinflation the IMF helped to install a currency board, the lev being tied to the deutschmark and then the euro. The exchange rate has not been changed ever since. These are the macroeconomic successes of the country, which are often mentioned by Bulgarian politicians of all parties both inside the country and abroad. However, none of the recent governments was successful in disentangling the fatal nexus between the mafia-like structures in large parts of the economy and the political elite. Corruption is still abundant at all levels, despite the EU’s (rather sporadic and mostly ineffective) attempts to exercise pressure from outside. The courts and the legal system overall are in a terrible shape and are susceptible to the corruption practices of businessmen and politicians, so the normal citizen rightly claims that the country is ages apart from a real rule of law standard. The institutional quality is thus very poor, even compared to the direct neighbours, so after the end of the construction and real estate bubble which burst in 2009, foreign investors have become rather reluctant to engage in new projects, the influx of new foreign capital thus shrinking severely. On top, the newest budget plans of the current government with a sudden inclusion of one billion leva new debt (half billion euro) endanger one of Bulgaria’s very few assets in the eyes of foreign investors, that of fiscal stability. The current protests, which stated 41 days ago after some strikingly dubious nominations to high posts in the new administration, and which were peaceful until Tuesday night, are very encouraging in many ways. First, the political elite slowly notices that neither the current coalition of BSP, the Turkish minority party DPS and the extreme right party ATAKA, nor Borisov’s GERB as the only opposition party in parliament are seen by the citizens as possible solvers of the country’s immense problems. Secondly, today’s protesters are to a large extent young citizens who until recently left the country en masse and hardly believed in the country’s politico-economic future. Suddenly these young people, with the help of facebook, twitter etc., self-organize in massive peaceful protests which have been applauded both by foreign ambassadors in Sofia and by international media for their civilized way to conduct the demonstrations. Bulgaria, whose population dropped from around 9 million 1989 to around 7 million currently, is in dire need of not losing a further generation to emigration. Will the protests be eventually successful? Today they continued massively and, fortunately, peacefully. The governing BSP’s elite emphatically rejected a resignation of the government. Interestingly, some of this party’s self-proclaimed dissidents said in interviews today that new elections in the near future might save the party from the impasse the party is in. But what is the alternative? This is one of the most pressing questions right now, and many of the protesters say in interviews that it is not a comeback of GERB they are trying to induce. A “grand coalition” of BSP and GERB is discussed in some of the politicians’ interviews but would probably be the least popular constellation for the normal citizen, since such a structure will hardly have any opposition in parliament and thus no political checks. It is interesting to observe what is happening and will happen with the remnant parties of the old anti-communist Union of Democratic Powers (SDS), SDS itself and DSB, which did not join forces at the last elections and spectacularly failed the 4% hurdle to parliament. Will perhaps new parties or movements arise out of the protests? Frankly, I do not know. What matters to me is that the protesters of all generations have raised their voice loudly and have said more than clearly “Enough!” to the current elite of all parties. It might be that Bulgaria’s transition will eventually have a happy end, which for me means that the country slowly approaches the ideal of a free order, consisting of rule of law framing a dynamic market economy, a functioning democracy and a vivid civic society. To be more explicit, this is the absolute opposite of turning the country into a small copy of Putin-led Russia, which might still be in the fantasies of some of today’s Russophiles in Sofia. In my reading of the protests, what most people in the streets dream of is that Bulgaria at some point becomes just a normal European country, perhaps with a modest living standard like our former “brothers” in Central Europe. Is this utopian? The weeks and months to come might prove decisive for answering this question. Stefan Kolev, born 1981 in Sofia, in professor of economics at the West Saxon University of Applied Sciences in Zwickau and managing director of the Wilhelm Röpke Institute in Erfurt, Germany. Do you have a twitter account by any chance? Thank you.